Here is a short clip from Noam Chomsky. He articulates why we should not to spend much time on climate change denialists. I love his comment, "you don't have to be an expert." There is another group that is not on board with the predictors of doomsday. These are the thinkers who dare to question their colleagues about such a politically charged topic. 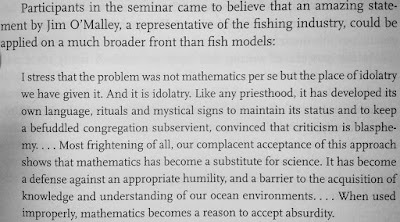 I'm reading now a great book, Useless Arithmetic—Why Environmental Scientists Can't Predict the Future, that describes in great detail the difference between qualitative and quantitative modeling... and why in a complex and chaotic world our guesses about outcomes have been so prone to failure. I just read the chapters about fish and AIDS (different chapters). Our numbers were so wrong about what would be sustainable fishing that we have wiped out entire fish populations. Our numbers were very much guesses on the numbers dying of AIDS in Africa. Even the numbers on second hand smoke are very suspect, though we know (qualitatively) that it ain't good to breathe SMS. I was amused to read about the Oracle of Delphi, who for hundreds of years, told people the truth... always in a stupor. It was later found that the river behind where the Oracle hung out emitted ethylene, a gas that has been used as an anesthetic. 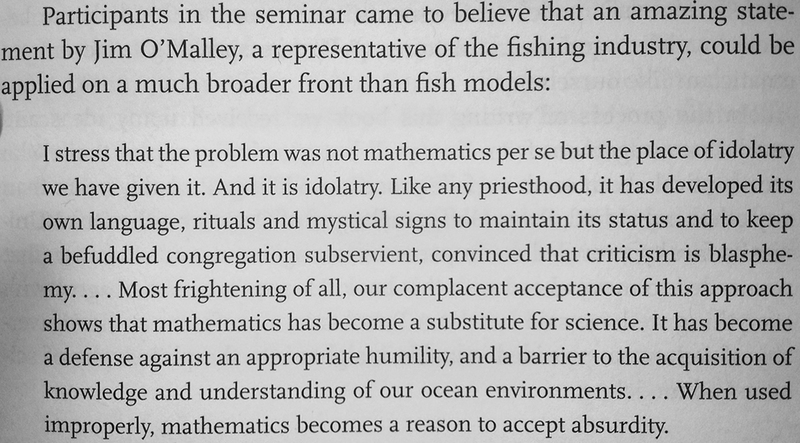 My heart stings when I read the blasphemous statements made about beloved mathematics. It’s not idolatry. It’s the most perfect human language we have. It is not the substitute for science. It is the language of science. It is beautiful. I remember attending a lecture by some guy who was studying the impact deer had on the understory of a forest (i.e. calculating how much green matter the deer ate). It was awful. During his talk he kept flashing these power point slides with these long equations and saying, “Well there’s the math, you can do it on your own.” Then boom, next slide. He didn’t explain anything of importance. I wasn’t even sure what was going on. Just a bunch of numbers that he jumped over. Did he even go any collect data? I was so confused and I actually thought for a moment that maybe I just wasn’t smart enough to understand this topic. At the end of the talk, the man asked if there were any questions. There were none. This was not how a lecture normally ended. A good talk would evoke thoughtful questions and interesting discussion. Often the question/answer section of these lectures was the best part. This man was staring at a quite room. We all left after that. As much as I love math, I know it can be used for evil. You describe the climate change issue as a politically charged issue. I would like to remind you that I have already made the argument that the debate about climate change seems polarized only because our political system has become a polarizing system. Anything the politicians discuss becomes polarized. You wrote that you were committed to ‘walk on the Earth as if it is your mother’s face’. I am asking you what that means in regards to the climate change issue. What is right action? What things do you think the people who believe climate change does occur from human activity want? What actions do you think they might take? What actions do you think people who don’t believe climate change want to make happen? How does internalizing one answer over the other translate into behavior? Anyway, his research indicates that that factors such as clutch size, forging behavior, and body shape of butterflies shift dramatically from El Nino to La Nina years. He is using data collected on one species of butterfly to predict these factors on another butterfly species he is currently collecting data on. His most basic premise is that weather effects butterflies. Is it such a leap then to believe humans effect the weather? I would like to be one those gentle people who sincerely considers their footprint as they walk, and who feels gratitude for all things. Right action is being awake, seeing the effect of our actions, and changing our behavior when we are doing harm. People who believe we are changing the climate want us to stop doing that. It hurts! People who don't believe in climate change, or who believe that it is not caused by humans, probably want the believers to stop crying. It takes a lot of wisdom and compassion to act responsibly. So how do you think people go about reducing global warming? Reduce driving? Make less polluting cars and industries? Plant trees? Build a CO2 reducing machine? True. . . But do you think they would necessarily be against a reduction in driving, less polluting cars and industries, planting trees, or creating a CO2 reducing machine? Is it happening or isn’t it happening is a polarizing question that will create polarizing answers. Creating a discussion about how a city might become more pedestrian friendly doesn’t seems so polarizing, but does address that climate change issue whether people want to ‘believe’ or not. Kate, I think you are absolutely correct... I've been thinking the same thought today... that calling it global warning or climate change polarizes the conversation. We have problems to solve to make/keep life sustainable for humans on Earth. From population to war to pollution to resources. Big problems... all so complex that sometimes it is paralyzing. Thanks!